Victory Siyanqoba Trust will hold its inaugural Human Rights Arts Gala in Ntepe Business Centre on the 27th of February 2016.Victory Siyanqoba Trust, a ZIMRIGHTS Outstanding Human Rights Defender Award winner 2015, is a grassroots Based Organisation that uses Art as vehicle for Community Development. 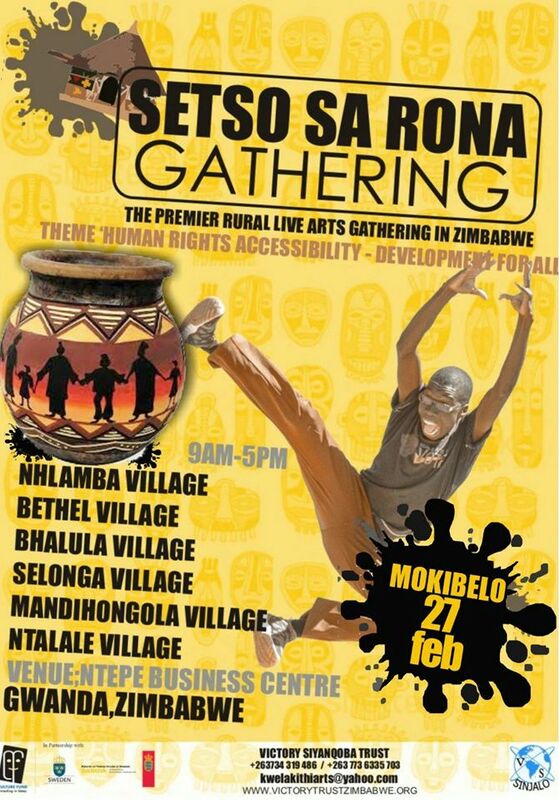 The Gala which is dubbed Setso sa Rona, The Premier rural live Arts Gathering in Zimbabwe will be held under the Theme: Human Rights Accessibility- Development for All. The event will see nine theatre groups from nine villages coming together to showcase theatrical performances which will encapsulate Human Rights awareness. The Theatre Groups have amongst their cast of actors; Councilors and village heads. The Broader objective of the Gala is to enhance rural communities’ understanding of their fundamental Human Rights as enshrined in the Constitution. The Gala is set to produce responsible and confident community leaders who are conscious of people’s rights and freedoms and continuously foster the accessibility of disseminated information on right issues within their communities. The Gala will serve as an interface between the Community and local government officials, Zimbabwe Human Rights Commission, Traditional Leaders and the Minister of Rural Development Promotion, Preservation of National Culture and Heritage. Victory Siyanqoba Trust realized that there is information gap between rural Communities and urban Communities. Due to the minimal access to local electronic media, Rural Communities have little contribution to the full realization of their rights. It is within this context that Victory Siyanqoba Trust conceptualized the use of Art as a means of conscientising the communities to know and celebrate their Human rights. The Gala is supported by the Culture Fund of Zimbabwe Trust in partnership with the Swedish International Development Agency (SIDA) and the Denmark International Development Cooperation (DANIDA). Clement Magwaza will be the guest Performer at the Gala.